^ "The Open Brand Register of Certified Products". The Open Group. 2014-05-29. Retrieved 2014-05-29. ^ "UNIX turns 40". IBM Corporation. 2011-02-09. Retrieved 2011-02-09. ^ a b Jones, Pamela (August 25, 2005). "2002 IBM Internal Email on Project Monterey - "No One Wants It"". Groklaw. Retrieved 2007-05-20. ^ "Novell Wins Again — Jury Rules Copyrights Didn't Go to SCO". 2010-03-30. Retrieved 2010-03-30. ^ "IBM AIX 7 preview". IBM Corporation. 2010-04-16. Retrieved 2010-04-16. ^ a b "IBM AIX 7.2 Announcement Letter". IBM.com. Retrieved 2015-10-05. 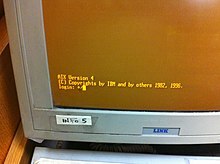 ^ "IBM AIX PS2 1987 Announcement Letter". IBM.com. 1987-11-03. ^ "AIX Version 7.1". Retrieved 2011-05-03. ^ "IBM AP Announcement Letter". IBM.com. Retrieved 2010-12-27. ^ "IBM AIX Version 6.1 operating system: Overview". IBM.com. Retrieved 2010-12-27. ^ "Software withdrawal and support discontinuance: IBM AIX 6, IBM System Director for Power Systems and associated licensed programs". IBM.com. Retrieved 2015-09-29. ^ a b "System p product lifecycle dates". IBM Software Support. Retrieved 2010-12-27. ^ "System p product lifecycle dates". IBM Software Support. Retrieved 2010-12-27. ^ "Object Data Manager (ODM)". sysadminexperts.com. SysAdminExperts. Retrieved 18 June 2016. ^ "IBM Knowledge Center: Object data manager". www.ibm.com. 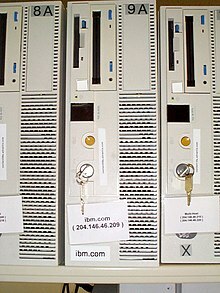 IBM. Retrieved 18 June 2016. ^ "IBM Training White Paper: Understanding the AIX Object Data Manager". www.globalknowledge.com. Global Knowledge. Retrieved 18 June 2016.